Earlier I wrote about the myth of emergency fund. For some reason, I didn’t get much good feedback about it, neither it received a good amount of views. But the topic is important. An emergency fund is a must for good financial health. In this post, I’ll simplify emergency fund, by just focusing on the setting up of the fund. Let’s assume you don’t have anything for an emergency fund right now. Let’s set up one, right now. We all need it! One of the most effective ways to safeguard against an uncertain future is to set up and maintain an emergency fund. This involves putting away a certain amount of money every month in order to cover some unforeseen need in the future, such as illness or the loss of employment. For such purposes, it is advisable to set aside enough money to cover three months’ worth of living expenses. It might seem like a tall order to be sure, but it can be done. 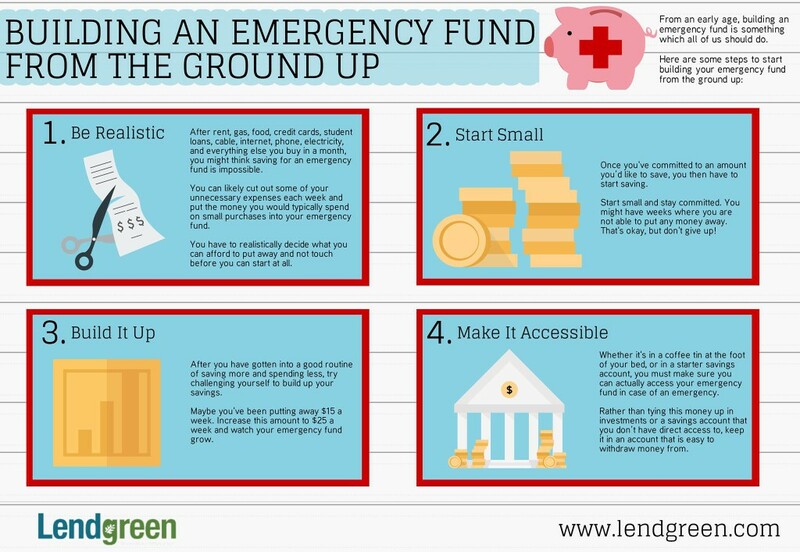 Here are some tips on how you can start and maintain an emergency fund. Planning to save is a good thing, but keep a realistic view of your plans and expectations as well. Although you will want to put as much money as possible in your emergency fund, expenses can really get in the way of the best-laid plans. Any contributions you make to your emergency fund will likely have to be drawn from the funds you have left over after paying your monthly expenses. Keep in mind also that your savings aren’t likely to balloon any time in the near future, unless you are incredibly lucky and/or already wealthy. But keep plugging away at it and put in the required amount every month, and your emergency fund will eventually grow to a significant amount. With all the little–and not so little–expenses you have to deal with every month, it can seem like a tremendous challenge just to get started with an emergency fund. Expenses such as rent, gas, food, credit card bills, student loan payments, electric bill, and cable, the Internet, and phone bills can take a serious chunk out of your finances. However, getting started small is better than not getting started at all. If necessary, try eliminating unnecessary expenses and those myriad little expenses that add up. By doing so, you should be able to scrape up even just a little bit of cash to place into your emergency fund. Building up an emergency fund is a long drawn-out process that will require patience and perseverance–and lots of it. Oftentimes, you will veer off track and struggle to keep your savings going. It is important to keep your goal in mind and to remain committed to achieving it. It might be helpful to decide on a specific amount to save every month–keeping your goals realistic, of course–and to do your best to stick to the plan. If you do miss out on a deposit or two, strive to make up for it when your finances allow. Resist the urge to dip into your savings. It can be tempting to “shift things around” with the idea of replacing the used funds later, but this is a slippery slope that is best avoided. After you have gotten into the habit of putting a little something away every month, see if you can increase the amount you put into your emergency fund slightly. If you have been consistently maintaining your fund, you are probably fairly comfortable financially speaking. You might, therefore, want to use the opportunity and the added financial liquidity to boost your savings. By doing so, you not only increase the amount of money that goes into your emergency fund but speed up the rate at which your savings grows as well. Finally, make sure the funds are readily available when you need them. Although there is something to be said about investing your money or keeping it in a time savings deposit, these options will greatly limit the availability of your funds. Ideally, you will want to place some of your money in a number of investment and savings options, while still maintaining an emergency fund that you have ready access to if and when you need it. Readers, it’s shocking to learn that more than 75% of Americans don’t have an emergency fund setup. No emergency fund compel us to borrow money which results in debt, a life-long debt perhaps. Start building your emergency fund today, perhaps with just $100. Open an online savings accounts and transfer this $100 from your checking account. Contribute regularly, maybe another $100 per month. In no time you will have a sizable fund for your emergency needs. If you don’t have an emergency fund, size doesn’t matter what matters most is starting now! One of my favorite pieces of advice for emergency funds is to put it in a stable investment vehicle, like high-grade muni bonds or corporate debt ETFs. Yes, it’s possible (however unlikely) that you might get some principle reduction, but the return will allow your emergency fund to slowly grow over time on its own. For a basket of dollars that is not meant to be touched, it only makes sense to allow it get some sort of return. I always tend to favor the idea of having the emergency fund in a liquid state. Muni or corp debt ETF’s may give higher return but you’ll need to wait 3-5 days before getting your hands on the fund. so how do you propose to create liquidity? One option, I think, could be to pay with credit card immediately and pay the credit card back as soon as you get the money liquidated. Any other option you want to share for increased liquidity? You’re right to note the “slipper slope” of dipping into your emergency fund for non-emergencies. That creates a whole host of problems! I like my emergency fund to be semi-liquid, but also hard enough to reach that the temptation to borrow from it isn’t there. Do not stop till you build sufficient money built up in the fund. Start now and continue. Remember slow and steady always wins in case of personal finances.